Also referred to as Verres Hyalites (Hyalith Glass), this was a group of vases produced by Galle for the 1889 Paris International Exhibition. 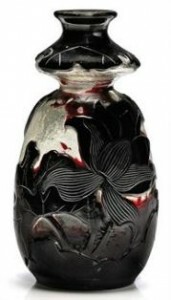 Here a transparent glass vessel was overlaid in black or dark brown glass, then carved. Included in this group are the Orpheus and Eurydice vase designed by Vicor Prouve (now in the Paris Museum of Decorative Arts) and the others carved with swarms of butterflies or moths, leaping monstrous insects, Amor Chasing the Black Butterflies with his little bow and arrow, plants and flowers. The finely carved subjects made full play of the contrast between the dark surfaces and the transparent base, with all the subtle cloudiness, made possible by thinning the outer layer. The subjects, with the possible exception of the somewhat curious Amor Chasing the Black Butterflies, are invariably impregnated with dying, death and the ephemeral nature of life.